Here is Small Guide on How To Create Gradient Bokeh Effect and a Step by Step Infographics Showing How You Can Create Dreamy Backgrounds. Those who are new to digital photography can read our useful articles like Basics of Bokeh in Photography, Tips and Ideas to Make Custom Bokeh Shapes, How to Create Perfect Bokeh With Your DSLR and Prime Lens like articles. Keep in mind – Diaphragm Blades are quite important determining factor for shape of the bokeh. With a Full Frame or Medium Format Camera, there will be less distortion at the edges, apart from cropping factor; small sensor size has some impact on the optical effects too. Depending on the type of spray bottle, you will have settings to deliver foggy water droplet. 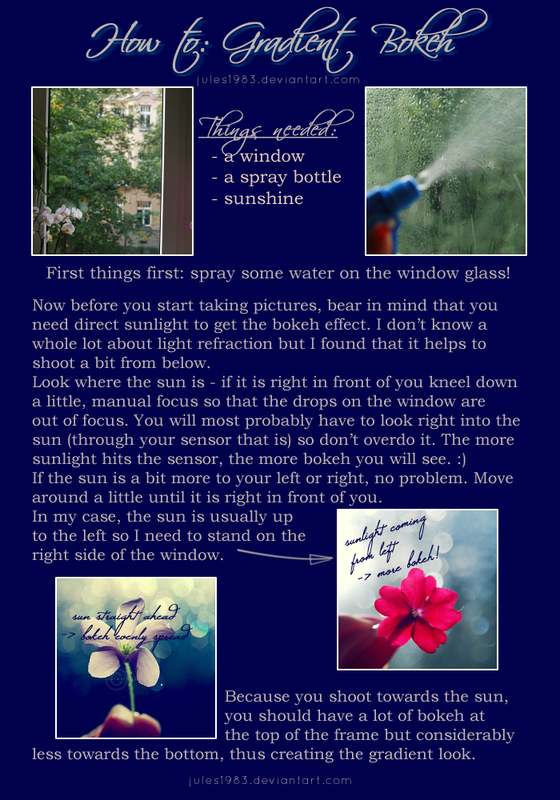 You will definitely spray water after initial setup of the objects to take photograph, but it is important to understand that, sunlight should come from the left side (or may be right side) only – one side only. This is only possible at morning. So, the sunlight will actually hit the sensor directly at about 160 degree angle or like that. First, arrange the situation, place the subject; it is great if you have a tripod and a shutter release cable. Take test shot for proper composition of the photograph. Now spray the water like mist on the Window. You will get a nice gradient bokeh effect as Sun will light the upper part more than the lower part. This Article Has Been Shared 5347 Times! Cite this article as: Abhishek Ghosh, "How To Create Gradient Bokeh Effect," in The Customize Windows, July 26, 2014, April 26, 2019, https://thecustomizewindows.com/2014/07/create-gradient-bokeh-effect/.